Flashback: How the media sugarcoated the Egypt uprising | can i just finish my waffle? ← So obama wants to be a CEO…..
We were warned, mostly by conservatives, that the Muslim Brotherhood would take over in Egypt. It wasn’t hard to see it really. The warning flags were very apparent. And it is coming to pass. We are lied to and misled time and time again by our left wing media, or more accurately, we are brainwashed. They portrayed this uprising as a wonderful thing, broadcasting live as they gushed over what was happening. obama also praised it and supported it, saying democracy was really breaking out in Egypt. He knew, they all knew what would happen and they supported it. How long are we going to put on blinders and go whistling along? Below is a repost written last year February 1, 2011. It illustrates the contrast between the propoganda on the media and the reality. The propoganda continues to this day. I turned to Morning Joe this morning for the first time since the Egypt riots started. Then on the Daily Run Down, Brian Williams comes on, from Cairo, and describes the crowd as ? darn can’t remember the word he used, whatever, it made it sound like they were dancing in the streets. Just remembered: It was “jubilant” is the way he described them. So did I miss something? What happened to the fires and the rocks and smashed cars and broken ancient statues? But then this is MSNBC. These are the same people who have described the Tea Party, a peaceful assembly of American citizens as angry mobs, racists, thugs and tea baggers. Nice to know Egyptians get more respect than we do. But it’s okay. Really. This just makes me look at this more closely. These demonstrators more than likely are not what they first appear, for democracy and all. Anti-American maybe? The first flights evacuating stranded Americans from Egypt took off today amid escalating violence across the country and desperate scenes at the capital’s international airport. 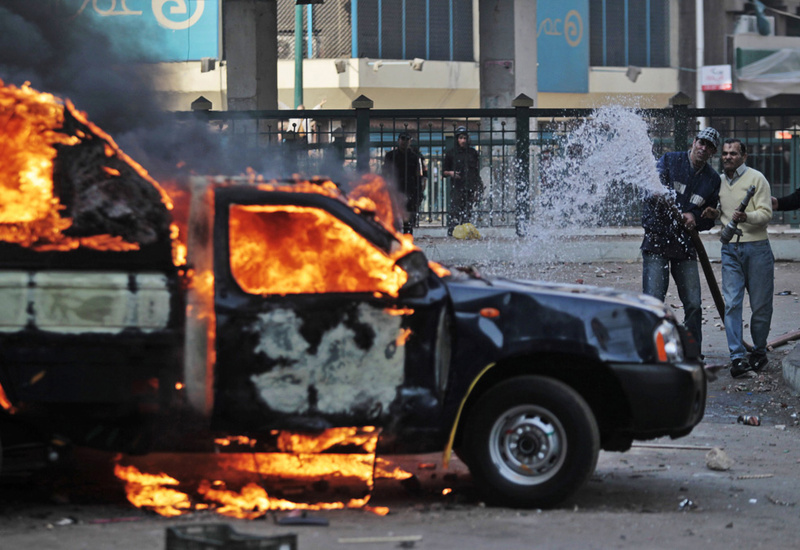 In Egypt, violent anti-government demonstrations have claimed 27 lives and left thousands injured. One source dated today says there have been 100 killed. In one of many astonishing scenes Friday, thousands of anti-government protesters wielding rocks, glass and sticks chased hundreds of riot police away from the main square in downtown Cairo and several of the policemen stripped off their uniforms and badges and joined the demonstrators. There was the burning of tires and police cars. Compare the scene above with this scene in our own country. This is democracy in action with peaceful assembly addressing grievances and taking it to the VOTING BOOTH – civil and quite orderly. How radical, huh? 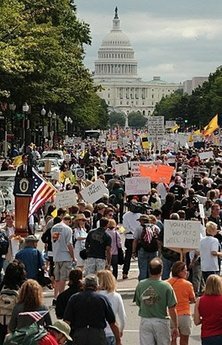 Of all the Tea Party demonstrations, there has not been one arrest. No violence whatsoever. Yes, prayer and song and the pledge of allegiance to the flag. Lots of talk about the Constitution. 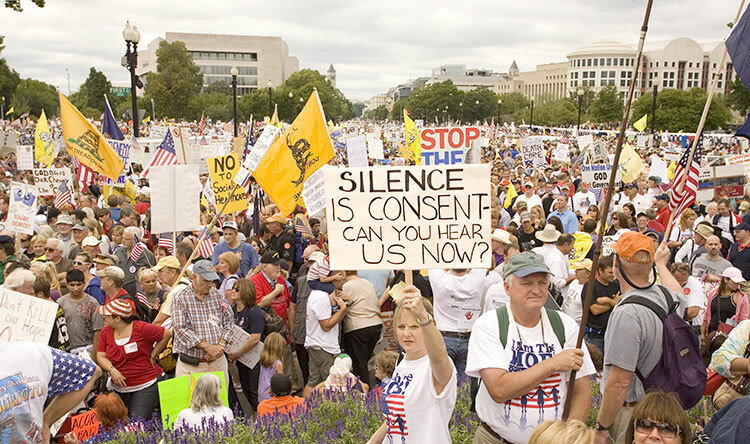 And what did the MAINSTREAM corrupt media have to say about the Tea Party? They have lied, that’s what they have done. Posted: 02.01.11 Updated: 02.01.11 @ 12:43 p.m. and 3:00 p.m. Reposted: 01.15.12 A.D. @6:09 p.m.